Courtesy of the Library of Congress (LC-USZ62-115183). This pioneer woman sculptor was a descendant of James Hosmer, who came from England to Massachusetts in the 1630s. Since her mother died of tuberculosis when Harriet was four, her father encouraged her outdoor life. 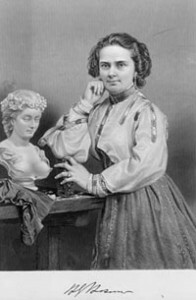 At Mrs. Charles Sedwick’s School in the Berkshires, her Unitarian school classmates, novelist Catherine Maria Sedgwick and actress Fanny Kemble, suggested that she become a professional sculptor. Medical schools then denied women students, but a friend of her physician father taught her anatomy. When she was studying in Rome, her overseer was actress Charlotte Cushman. John Gibson, an English sculptor, accepted her as his only student. Among the sculptor’s many friends in Rome were Robert and Elizabeth Barrett Browning.